As you’re using baby wipes to clean your baby, you’ll know how cold they can get when the temperature drops. Using them on an infant on a cold night can cause a bout of crying as your baby will find them uncomfortable. 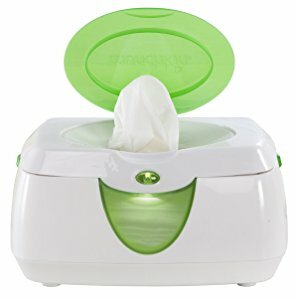 If you want to avoid the unnecessary hassle that cold wet wipes can bring, you should consider using a baby wipe warmer. The best baby wipe warmer can give any hygiene product an upgrade, and can make your nappy changing sessions more peaceful. Midnight cleanups don’t have to be highly uncomfortable for your little one. That is why most parents use baby wipes anyway, so they don’t have to expose their kids to water every time they need cleaning. With an excellent baby wipe warmer, you won’t have to make your baby uncomfortable with a cold wet wipe, guaranteeing that they won’t get shocked by the sensation that cold cleaning comes with. If you want to cut to the chase and just go for the most popular baby wipe warmer on the market, then you should try the Munchkin Warm Glow Wipe Warmer. This product has convenient features that offer ease of use for you and comfort for your baby. Designed with a large see-through window, and a flip top lid, it promises easy use for parents. It won’t require you to refill as often and you can easily monitor the number of wipes that are still inside. You also won’t have a hard time grabbing a few wipes while grappling with a fussy baby with this item as it’s very easy to work with. We also like this product for its low voltage. This means you don’t have to worry about it causing a spike to your electric bill even if you keep it plugged in all the time. This also ensures that it will generate heat that is only slightly warmer than room temperature, making each wipe feel just right for your baby. What's Great About It: Efficient is a good description for this Munchkin baby wipe warmer. As it is designed to warm up the wipes from the top to bottom, you can always be guaranteed to use a warm wet wipe on your baby’s skin. It is definitely a solid pick for those who want the best device for their little ones. 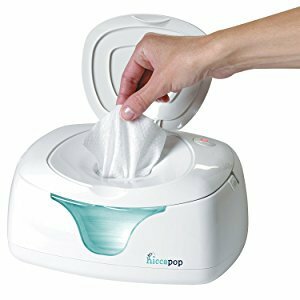 If you’re partial to best-selling items, then the hiccapop Wipe Warmer might just be the perfect pick for you. With over one million units sold around the globe, it can guarantee top-notch quality and reliability. What makes it a great pick for many parents is its friendly price. While it’s not exactly cheap, it also won’t cost you an arm and a leg, and you are promised a decent quality item. It does everything a baby wipe warmer should do, ensuring that you can get the job done. Like the Munchkin Warm Glow, this hiccapop product also offers high-capacity storage and energy efficiency. No need to worry about higher electric bills or dried out wipes in their original packaging. What's Great About It: Being designed with easy access and top-heating style, this product can guarantee ease of use. This is exactly what you should look for in a wipe warmer since they’ll be used in high stress times. We also like that it comes with an instruction manual. It details how to maintain and clean your unit the way the manufacturer deems safe. With such official information, you won’t have to worry about voiding the warranty. 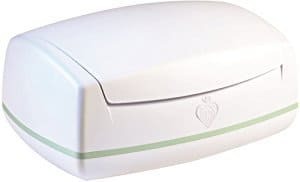 Made specifically for reusable cloth wipes, the Prince Lionheart Warmies Wipes Warmer can be another device worth considering. Regular wipe warmers can’t accommodate the thicker materials of these items, so this device offers something new. Cloth wipes are, without a doubt, excellent alternatives to regular wet wipes. Because they’re reusable, they’re deemed to be more practical and eco-friendly by lots of parents. With this Prince Lionheart warmer, you can enjoy the best of both worlds. With cloth wipes being thicker than regular wipes, their warmer needs more power if it’s going to get the job done. 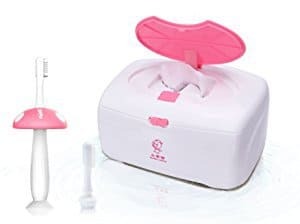 This product delivers that power, making it a good addition to your baby’s hygiene arsenal. What's Great About It: We really like its special design that heats up cloth wipes evenly. This ensures that you can use the wipe whichever way you grab a hold of it. No more angling and risking the use of a cold portion on your baby’s skin. This can definitely make changing sessions less challenging. It also comes with four reusable wipes and an Everfresh pillow, extending your money’s worth. We certainly love freebies, so we truly appreciate this add-on. For a device with a slightly different heating technique, you might want to take a look at the Baiyea Wipe Warmer. Unlike the other items on this list, it lessens the odds of drying out your wipes with its top-warming system. One of the most common complaints about baby wipe warmers is that they can dry out a fresh batch of wipes. This is wasteful, creating a big issue for most parents. Some manufacturers solve it by requesting users to use a sponge or add a cup of water to the unit to add moisture. All of these can be a hassle, so the Baiyea Wipe Warmer took a different route. It works by only warming up the first five to seven wipes on top of the stack. With this, you can rest assured that the others in the stack won’t dry out. It also comes with everything else that can make a baby wipe warmer convenient to use. It has an easy-open flip top lid and a soft nightlight. It promises not to require a lot of fuss while changing your baby’s diaper. What's Great About It: For picky parents, it’s nice to know just how warm this device can get. It notes that it will only warm up the wipes up to 45C or 113F. It offers a “just right” temperature for a damp wipe that won’t burn or shock. Not a lot of baby wipe warmers list their target temperatures, so this feature is great. Midnight cleanups don’t have to be highly uncomfortable for your child. This is why most parents use baby wipes to start with. There’s no need to expose your kids to water every time they need to be cleaned. With baby wipes, they’ll be squeaky clean in no time without having to leave their nursery. Baby wipe warmers can boost the comfort and convenience these hygiene products offer. As wet things tend to get cold quickly, your wipes are prone to feel cold on a chilly night. Not warming them up will be a shock your baby’s skin and they will not like that. Like in the use of just about any other baby product there is, though, parents are divided when it comes to baby wipe warmers. Some say that it’s not necessary and frivolous. Others find it a major necessity. If you’re on the fence about this product, you might want to know more about what it can offer. Even if these items are very affordable, some people still don’t find them practical. Using wet wipes at room temperature didn’t hurt anyone before, so why bother now? Just because folks didn’t need something before doesn’t mean they can’t improve their lives with it today. It won’t hurt if you want to boost the quality for your little one with a baby wipe warmer. Because babies aren’t fully developed yet, their temperature regulation isn’t as good as yours. They’re very prone to getting cold as their bodies tend to lose heat more easily than adults. They also have slightly lower body temperatures. And as a rule, you should add one more layer of clothing as compared to what you are wearing on cold days. Their inability to adapt quickly to the changes in temperature is important to pay attention to as it is vital to their survival. While using cold wet wipes won’t exactly be the same as exposing your child to a cold wind or dipping them into a tub of cold water, it can still easily make them cold. Infants’ bodies have larger surface areas compared to their body mass so they tend to lose heat easily. Their bottom area may be small for you, but for them, it already requires hard work to keep warm. This is why wiping a wet wipe on a small surface area can already impact their temperature regulation significantly. When a baby is uncomfortable, they get fussy and stressed. These emotions can snowball easily. Everyone at home will also get on edge. It also poses a huge threat to your child’s proper development. Using cold wipes can be some of the most common reasons why infants get uncomfortable. It can then develop into them getting stressed, especially if it’s cold and your infant’s sleep has been compromised by your effort to clean them up. Honestly, you and your child don’t need the aggravation that cold wipes can bring. A wipe warmer can help you avoid all of these problems. If you’re already convinced that baby wipe warmers are good additions to your baby’s hygiene arsenal, the next thing you might be thinking about is whether you can trust our choices. To assure you that we’ve taken great measures in choosing our product recommendations, we’re sharing our techniques on how we were able to come up with these four products. Like any other product, the features and specifications will always be the most important thing to look at when shopping for baby wipe warmers. We made sure that each item in our list can serve its function effectively. We also searched for items that are made of high-quality materials and construction. There are so many opinions about baby wipe warmers and not all of them are worth your time. We already did the work for you by only recommending the best-reviewed items out there. Baby wipe warmers are very basic items, so you really can’t expect lots of bells and whistles in them. However, you are still be able to tell them apart by being very stringent. We made sure to compare the top-rated products’ features, prices, and other offerings to pin down the one that stands out the most. Baby wipe warmers may not exactly be necessities, but once you have one, you’ll know just how big of a difference it can make. It can help improve your household’s quality of life in its own way. It can also prove to be indispensable.